As a developer or administrator working with SharePoint, sometimes I need to know exactly what the data is doing, what on earth is it thinking. I may want to manipulate the data real quick without going to the website. This post may also very helpful if you’re working against SharePoint’s web services, as you can look at the exact data format you’ll get back per field. 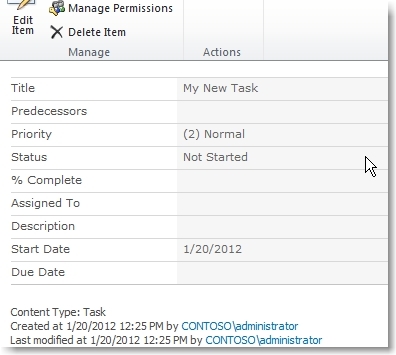 I am going to walk through accessing SharePoint lists and their items, reading and writing data using PowerShell. Using these techniques I’ve been able to create scripts to automate importing data, decrease development time as I can look at my raw data instead of the friendly view SharePoint gives us. You will need to be on one of the SharePoint servers to perform these actions. 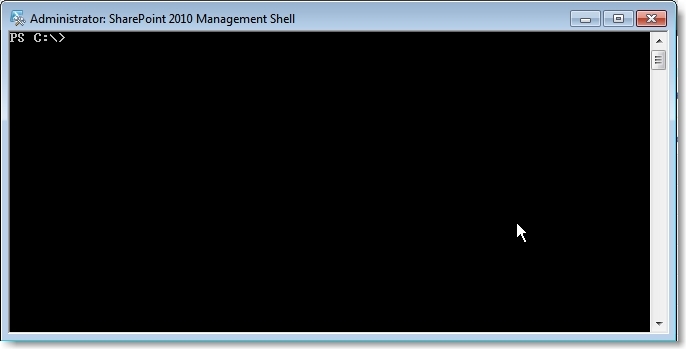 First thing to do is open the SharePoint 2010 Management Shell (located in All Programs > Microsoft SharePoint 2010 Products). This will open up a nice black window. Now let’s get talking with SharePoint. Before we can talk to a list, we need to talk to a web site. With this command, and most others, after you press enter, you won’t get a confirmation, you will return back to the prompt. The fact that you didn’t get an error, in most cases, means it worked. This should return your site’s name. $newTask["Title"] = "My New Task"
Required fields won’t stop you from adding a new item, so if it’s required, make sure you include it. Default values will automatically load, so you don’t have to worry about those. Now let’s read some data from it. Since I already have the $newTask object loaded, I don’t have to reload it, but I want to show how to get an item from a list. So now lets set the due date and assigned to fields. $task["Due Date"] = "1/21/2012 8:00 AM"
That’s because the Assigned To field is incorrect. We cannot simply write the user’s name, we need to write their id combined with their name. This is where it can get tricky. To find the user’s ID, you can click on their name somewhere in SharePoint, which should send you to their profile page. Looking at the URL, you’ll see userdisp.aspx?ID=#. The ID=# is their id. If clicking on a user name brings you to their site, then this won’t work. Instead we can use PowerShell to get their ID. Now with the ID and name, we can save it to the Assigned To field. The name should be the users full name, in my example, my name is my login name, bad data for a test account. 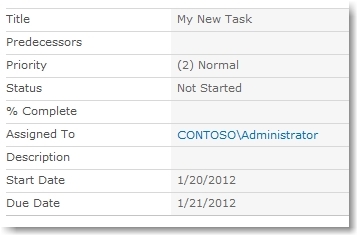 And when I browse back to SharePoint I’ll see this item has been updated correctly. and that will return the value we entered, but updated by SharePoint correctly. As long as the ID is correct, SharePoint will usually take care of the rest. Moving forward, working with complex fields like Choice, Lookup, and Multichoice, you can use PowerShell to open an existing item and look at the existing data to understand how SharePoint saves it. I added a lookup column to my task list, looking up the calendar. Let’s see what that data looks like. (If you modify a list or list item via the browser, you will need to close out the PowerShell session window and reconnect to the web and list). Note the Author and Editor fields, these are the Created by and Modified by fields. As you can see, PowerShell is quite flexible and powerful. Using scripts you can automate adding items, copying items from one list to another, and modify other system settings. I hope this helps, if you want to see something specific, please leave me a comment! Hello David, I would like to change month, week and day view titles for a list calendar display using powershell. Do you know how to do that ? And if you do, how did you get it ? Because I probably gonna have to change some more settings like that. Thank you so much if you could help me ! This is great. I am want to populate a choice field in a document library from a SQL table. I realize I could do this with site columns or external data sources but we have a 3rd party app that does not support those field choices at the moment. My temporary fix would be to dynamically update the choice items programatically. Any thoughts on how to complete that? I have a really simple thing I’m trying to achieve but can’t find what I need to, and my Sharepoint\Powershell skills are really basic. Can you help please? Sure thing! You can email me at david.lozzi at slalom.com. I would like to do this from systems that do NOT have SharePoint installed. What would I have to copy and register on another machine in order to do this. Sometimes, I use the function “manage copies”. I’d like to know how update all the copies of all items off a Library.